My dad bought me my first studio lighting equipment then fashioned and welded my fifteen foot solid steel background stands by hand in the garage. Ed King took me under his wing and on the road as a personal band photographer for Lynyrd Skynyrd, and then made sure some of my live shots ended up on their 1993 album. There were a dozen former celebrity subjects/clients also passed this year. Some of them blissful joys to work with – like Burt Reynolds – while a couple others some of my worst nightmares. One Diva in particular ironically couldn’t muster up even the smallest sliver of “Respect.” Ninety celebrities posed for my lens last year, which was literally half the number of five years ago. It was the first year in memory that I didn’t crack over 100. But times are tough and celebrities just aren’t taking as much time to plug their wares lately. Who knows, maybe like so many others they are more concerned with fighting for clean air and water, or busy protesting an administration that is literally locking toddlers in cages. Anyway, as we bid 2018 good riddance hopefully I can distract you with some of my more joyous moments as I present my TOP 20 LIST of Celebrity Portraits of 2018. As per every year, the ranking of these portraits are based on a combination of the star power wattage of the subjects, the artistic results and the difficulty of landing the quarry for those budding smart phone celebrity stalkers who may wish to play along at home. Let’s begin! In the call to “Make America Great Again,” the illusionary image that so often comes to mind in the President’s base is the utopian landscape straight out of “Leave it to Beaver.” Last year that series childhood star, Jerry Mathers (as the Beaver), turned 70. 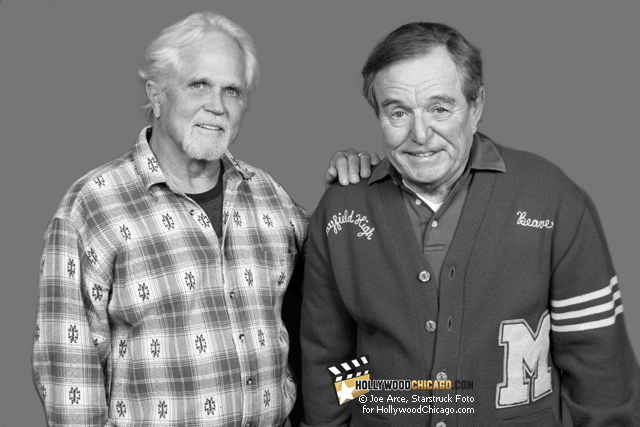 And Tony Dow, who portrayed his “aw shucks” older teen brother Wally, is now 73 years old… one year older than the current occupant of the White House. Unlike our Commander in Chief, both Mathers and Dow served their country in the military – the former in the Air Force Reserve and the latter in the National Guard. The popular urban legend that Jerry Mathers was killed in Vietnam, while obviously false, served to illustrate how for so many “Leave it to Beaver” represented the idolized safe space of 1950’s suburban middle class values. From 1957 until June of 1963 – when Wally prepared to go to college – the show was both critically and commercially a cultural juggernaut. It launched a wave of books, lunch boxes, board games and other merchandise. The series has been in syndication from my earliest memories of television. As I photographed them, Mathers seemed very much in character… proudly displaying his characters fictional Mayfield High letterman sweater, complete with Beaver monogram. Fifty-five years after the series finale the now septuagenarian actors smile for the viewer, but there is something slightly disturbing about the portrait. I think it speaks about the role of nostalgia in general, harkening back to the glory days of youth that may have never truly existed, as we would like to remember. LOCATION/DATE: The Hollywood Show (Rosemont, Illinois), March of 2018. It’s been often said that one of the keys to success is dressing the part, and never has that been truer than in the case of Bob Mackie. His nicknames include the “Sultan of Sequins” and the “Rajah of Rhinestones”… Mackie has won nine Emmys and been nominated for three Oscars for his costume designs. And notable, as the show designer for The Carol Burnett show for 11 years, he designed the famous “Went With the Wind” curtain rod dress that now hangs in the Smithsonian Institute. His second most legendary work was Cher’s 1986 Academy Award dress with the towering showgirl style headdress… that had audience member’s jaws dropping. As the dresser of Divas like Cher, Diana Ross, Whitney Houston, RuPaul and others – when a concert tour or Vegas show needs sparkle – Bob Mackie is the guy they call. He once said that a woman who wears his clothes is not afraid to be noticed, and it wasn’t long until Mackie himself was getting almost equal billing. In 1981, he appeared of two separate episodes of The Love Boat, and in 2002 was inducted into the Television Hall of Fame. Naturally, Mackie designed all the costumes for the Broadway bound “The Cher Show” when it premiered here in Chicago. Not only was he willing to pose for me, but that shoot would help me land the biggest “get” of the year for me the following week. Once again, Bob Mackie was doing what he does best… helping another artist sparkle. LOCATION/DATE: The Oriental Theatre, Chicago, June of 2018. Ginger Zee is no stranger to “dark clouds,” and who would have ever guessed? She first appeared on my radar, bright and warm, as the local NBC5 weather forecaster…. even then I contemplated reaching out and offering to do her head shots, as I had done for a couple other local news anchors. Before that even happened she was off to the big leagues as the meteorologist for Good Morning America, and in 2013 she then landed the coveted spot as Chief Meteorologist for ABC News. But what viewers didn’t see in the glare of the spotlight was her long battle with clinical depression, which included a youthful bout with anorexia. According to her 2017 memoir “Natural Disaster: I Cover Them, I Am One,” before she left for New York her condition got so bad that she voluntarily checked herself into an inpatient mental health treatment facility, to finally get the help she needed. Like her weather coverage Ginger Zee chased the storm and learned how to ride it out both on screen, and more importantly in her personal life. “The clouds don’t last forever,” she related to HollywoodChicago.com in an interview, “That’s not how the atmosphere or life works.” Not only did those clouds lift but also she learned how to dance in that new light, placing third as a celebrity contestant on “Dancing With the Stars.” Now married with two children, she harnessed her creative whirlwind last year to write a semi-autobiographical tale about a young girl who has an affinity for extreme weather events. The middle school novel “Chasing Helicity” encourages young girls to embrace their love of science, and fearlessly ride out the inevitable storms that life may bring. And just as predicted, Ginger Zee bestowed a portrait as scorching as an August day. LOCATION/DATE: Anderson’s Bookshop Event at North Central College (Naperville, Illinois), August of 2018. This year marked Al Roker’s 40th year working for NBC-TV. The seemingly always sunny meteorologist – originally from Queens in New York City – got his TV start at the NBC Cleveland affiliate WKYC in 1978. Joining The “Today” show in 1996, Roker’s infectious humor, humanity and charm easily won over viewers, even as his duties expanded far beyond prognosticating the weather. As the jovial “Today” co-host he would rack up 13 Emmy awards and in 2014 set a Guinness World Record for longest uninterrupted live weather reporting (34 hours). In addition, he was soon appearing as himself in numerous acting jobs, cooking shows and as the annual host of the Macy’s Thanksgiving Day Parade. As an author, Al Roker has penned both fiction and non-fiction. His “Morning Show Murders” was made into a Hallmark movie. In “Never Going Back: Winning the Weight Loss Battle for Good,” he documented his own personal struggles with weight loss and the complications of his 2002 gastric bypass surgery. I photographed Al to help promote his latest book “Ruthless Tide: The Heroes and Villains of the Johnstown Flood,” but what flooded my lens was that familiar radiant smile that had brought a warm front into the lives of so many. “Happy Al-iversary” trended on Twitter for December 14th, 2018, his 40th year on NBC, and among a torrent of well wishers were celebrities like Oprah, and everyday loyal viewers alike. LOCATION/DATE: Anderson’s Bookshop (Downers Grove, Illinois), May of 2018. Nichelle Nichols has always been a pioneer. As Lieutenant Uhura on the original 1960s “Star Trek,” she was the first African American on television that had an equal role in an ensemble crew… she was viewed and treated as an equal aboard that fictional starship, during the height of the Civil Rights movement. When she contemplated leaving the show to pursue other roles, no less than Dr. Martin Luther King Jr. convinced her otherwise. He reminded her of the historical significance of being viewed by millions as an officer, and fourth in command, in that vision of the future. Besides that, he confessed it was his and his family’s favorite show and they all watched it together. “Star Trek” creator Gene Roddenberry was making a bold new statement, not only about race relations, but a woman’s rightful place in the job industry as well. Last year also marked the 50th anniversary of U.S. TV’s first interracial kiss, which Nichols participated in. In the 1968 Star Trek episode “Plato’s Stepchildren,” William Shatner’s Captain Kirk and Nichol’s Uhura lock lips in an onscreen kiss. This was only one year after the Supreme Court overturned the ban on interracial marriage in the case of Loving vs. Virginia. That episode generated the largest amount of mail the show ever received, both positive and negative. Nichols would reprise the Uhura character in six Star Trek films and the animated series. Her appeal on the show also resulted in her being offered a job as the recruitment face of NASA… focusing on women and minorities. One of those recruits, Astronaut Mae Jemison, became the first African American woman in space, and she credited Uhura as her childhood hero. At age 86, Nichelle Nichols is still fighting for her rights and those of others. Recently, she was even battling in court against her son for the right to continue working despite a medical diagnosis of dementia. She claims that independence to earn her own way is essential to her pursuit of happiness to live long and prosper. Indeed! LOCATION/DATE: Wizard World Comic Con, Rosemont (Illinois), August of 2018.